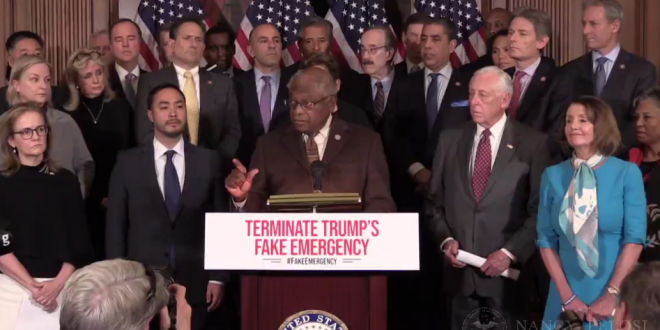 House Democrats: "Terminate Trump's Fake Emergency" - Joe.My.God. House lawmakers will vote, likely within hours of Trump’s arrival in Hanoi, on a resolution of disapproval that would block the president’s national emergency declaration to secure funding for his long-desired wall along the southern border. A Democratic leadership aide said that the president’s travel plans played no role in the House floor schedule. The resolution is expected to pass the House and shift the spotlight to the Senate, where a handful of Republicans may side with Democrats to oppose Trump’s emergency over concerns it skirts congressional authority. The clip below is live at this writing.